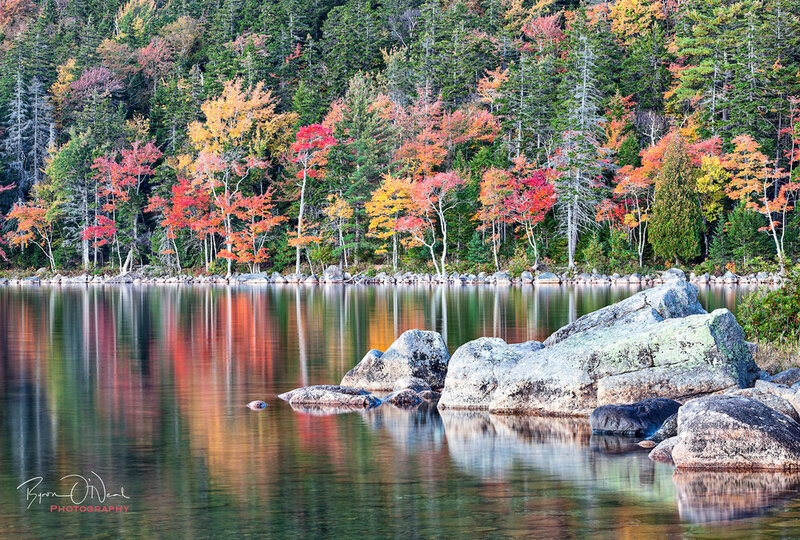 Jordan Pond is one of the jewels of Acadia National Park. In the fall, the area explodes in a riot of red, yellow, and orange providing a rich diversity of photographic opportunities. The pond itself sits at the bottom of a gently sloping hill just down from the Jordan Pond House through a low stand of blueberry bushes and the surrounding trails are easy enough even for those with some mobility challenges. One of my favorite spots (see map below) is a short walk from where the Jordan Pond Nature Trail breaks to the right hand side. The rocks provide a nice foreground element and the wind tends to stay a bit calmer here often allowing for soft reflections of the autumn colors on the water. The weather tends to be quite variable in October. You are likely to get more than a few days that are overcast with a light rain, fog, or both and this is a great time to visit here. The full loop is a flat 3.4 miles around the pond back to where you started but the best photo opportunities I’ve found are close at hand as the natural notch on the southeastern part of the pond keeps the shoreline close and doesn’t require you to break out the bigger glass and the Bubble Mountains on the northern end make for one of the classic Acadia shots in nearly any weather. If you are looking for another short hiking option, consider walking one of the carriage trail paths that branch out from where the pond contracts and becomes Jordan Pond Stream. The stream meanders through the surrounding woods, providing very different opportunities than you will find from the openness of the pond. These scenes are more intimate and it’s easy to loose track of time playing with compositions of colorful leaves and bubbling streams. The woods are a good refuge if you happen to get caught in heavier rain. I’ve waited out everything but a heavy downpour down the trail from the pond. The rain brings with it the scent of balsam fir as the needles get damp so as long as you come prepared with a rain jacket it should be a pleasant experience while you wait for the storm to pass on, just don’t confuse a moderate rain with a nor’easter which can be dangerous to be out in as branches tend to fall. Common sense should be your guide. If you are there and a nor’easter hits, head for the Park Loop Road as the waves can get pretty spectacular. The flip side to this coin is that in bright, sunny conditions the dynamic range becomes very challenging in the forest. If you don’t like the weather, just wait cause it will change. I’ve been visiting Acadia in the fall for over a decade and have lead photography workshops there. Over the course of a week’s time, you are likely to get a few days of heavy rain and a day or two with bright sunshine. You never can quite tell from one day to the next what you are going to get. Serendipity happens, be ready for it. For those wanting to stretch your legs, you could tackle the Bubble Mountain hike at the northern end of the pond. The easiest way to get in and out as a photographer is to take the Jordan Pond Road north past the pond. Just past the northern end is a parking lot on the left side. This is a quick hike up the hill to view the lake towards the south. There is a locally famous boulder on the South Bubble in what seems like a precarious position aptly named Balanced Rock. If you have the time, it’s not a bad vantage point to try out a sunrise shoot after you’ve done the Park Loop Road. I’d rank this above a Cadillac Mountain sunrise myself. No visit to Jordan Pond is complete without a visit to the Jordan Pond House for lunch. The lobster stew and popovers are your go to menu items. Sadly in 2013 the contract expired for Acadia Corp who managed the restaurant for over eight decades for the park service. Thus the curried chicken salad is no longer on the menu. It was my favorite. Much of the charm still remains and you should plan on an enjoyable lunch there before or after you shoot. The restaurant used to close earlier in the season but with the increased volume of cruise ship traffic coming into town every fall they usually are open until late October. It’s easy to get in a hurry shooting in Acadia in the Fall. With so little time and so many iconic locations, you will want to bounce around a lot and that is indeed part of the fun as there is so much to photograph in a relatively small geographic space unlike the bigger more spread out national parks. Make sure from time to time you stop to actually look around and that includes looking up at the sky and down at you feet. In the morning on a colder night, you will find the leaves underfoot coated with frost for an hour or so after sunrise so before you pack it in for breakfast, make sure to see what you can find at your feet. October 15th is usually the peak in Acadia within a day before or afterwards. If you happen to find yourself there in a windy year, the peak color could be on the ground. Look for opportunities in the slow moving areas of a stream and extend out your shutter speed for colorful circular patterns in the water. If it hasn’t been windy, the overhead canopy around Sieur de Monts is great should you be packing a wide angle lens. In 1947, a fire raged across Mount Desert Island burning more than ten thousand acres in the park. This is why you will find far more color on the northeastern side of the park than on the western portion that was untouched. The western side remains largely a conifer forest with splashes of yellow. It terms of planning your shooting time, keep that in mind. Furthermore, the flora composition of the forest floor looks drastically different between deciduous and coniferous areas of the park. If there are plants growing below deciduous trees they are usually ferns which in the fall can range from green to yellow or a rust color adding more visual interest to a composition. Mosses and lichen dominate the ground below the conifers. 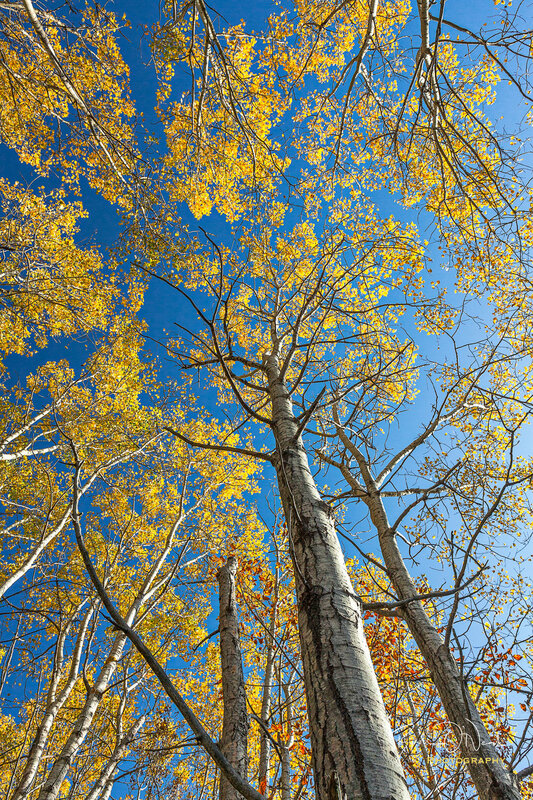 Look for elements of color to break up the strong linear forms of these trees.